While in Haiti, we saw how dehydration played a huge part in Haitian’s health. The children at lunch had bowls for their rice but, nothing for water. 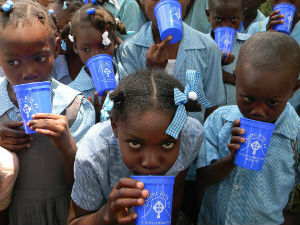 We ordered 250 cups that say Friend’s of Christ in Creole, to give to the student’s at the school in Bouyaha. In 2004 St. John’s started supporting the ministry of Pastor Mioche in Bouyahah and Pingnon, Haiti. Since then, we have supported the Pastor Mioche’s ministry financially and by sending clothing, household items, school supplies, and more. We also played a large part in constructing a building for a school in a very remote part of North Central Haiti. In 2013, ten of St. John’s members visited Haiti. Our goal was to raise $10,000 for the first phase of the school building. Thanks to St. John’s generosity and commitment to this ministry, we raised $23,000. Phase One consists of three classrooms and a kitchen. Construction on Phase Two has begun and continues whenever funds become available. Phase Two contains enough classrooms so that all the children can be out of the elements, as well as an administrative room and a secure storage room. At school, the children receive a hot lunch; many times this is the only meal the kids get all day. The 2013 mission team also provided medical care to the village, taught bible study to the children, had a women’s bible study, and taught young men how to build solar panels. We post updates directly to the Haiti Mission blog. You can also read other news about our ministry below. On March 21-28, 2019, eight people from southeastern Minnesota will travel to visit our mission partners in Haiti. From St. John's: Jen Smith, Emilie and Luckinger Hilaire, Wayne Hendrickson, and Dennis Foster. From Rochester Central Lutheran School: Missy Tjosaas. And from St. Paul Lutheran Church in Pine Island: Pastor Marie Anderson and Kari Toft. $6,500 is St. John's portion of a total $20,000 goal for a reliable pickup truck. Two congregations in Illinois will share the total cost. We're also looking for leads on a 2004-2010 3/4 or 1 ton, 4-door, diesel, 4 WD, manual transmission pickup with reasonable mileage. Come to the February 20 Oasis meal. Donations will go to support these projects. A pizza supper will be served 5:30 pm - 6:30 pm. Cash donations are always welcome! Cash or check to St. John's Lutheran Church clearly marked for Haiti Mission can be placed in the weekly offering or left in the office. St. John's has a long standing relationship with Pastor Mioche Rock and his Christian ministries in Haiti. St. John's worked in partnership with Pastor Mioche Rock to fulfill a dream of providing a Christian school in rural Bouyaha, Haiti. We are happy to greet you in the name of our Lord and Savior, Jesus Christ. We want to express our gratitude to you for your great response upon the request of Pastor Marie Anderson to assist us in transporting some donated food to our location in Pignon, Haiti. 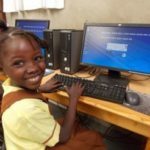 Friends of Christ School in Haiti has a child sponsorship program. For only $35 a month you can help support a child at the school. The congregation at St. John's has been supporting ministry in Haiti led by Pastor Mioche since 2004. Here are a list of things on their wish list. If you, your family, or your small group feels called to give, this is what your contributions will help support.